Cupcakes flavors were chocolate and vanilla with buttercream frosting. The zebra print was made with edible icing sheets and then cut individually and placed on buttercream icing. 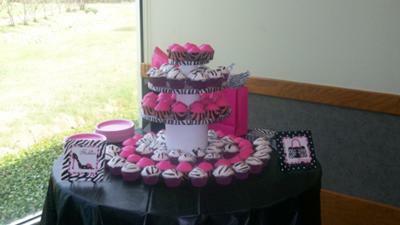 The cupcake stand was made with cake boards and cylinder boxes I bought at Micheal's as well as the zebra ribbon. How did u get that shade of pink for the frosting? Oh, now those are cute!